Works with Snap Tracks: A601 Ceiling Track or A602 Wall Track. 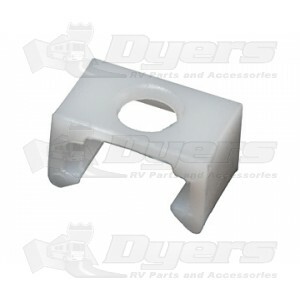 - At Top Between Clips 7/16"
Just what I wanted for the curtain in our semi truck sleeper. Pop off old ones & pop on new and snap! Fabulous really; made removing the track unnecessary. Which made my day. The sales associate I spoke with is so super sweet! I have an older tent trailer with a flat track system and wasn't sure if these would work on it or not. But they are perfect! The curtains glide very nicely and using the snap tape with them has made it so they stay attached when touched. The old velcro system was horrid! Fast shipping too! The product was exactly what I need and the service was superb.